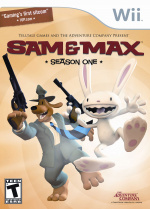 Announced last month, Telltale has revealed that the infamous Sam & Max franchise will be coming to Wii in the form of Sam & Max: Season One, containing all 6 episodes released so far on the PC counterpart. The Wii console is a perfect fit for the Sam & Max games. The series' story-driven gameplay and episodic structure has often been favorably compared to TV sitcoms. The new Wii version will present Sam & Max in a format that can be enjoyed from the comfort of the living room, either alone or with a group of friends—a setting perfectly suited for this kind of experience. The game's easy-to-use interface is ideal for a broad consumer audience. 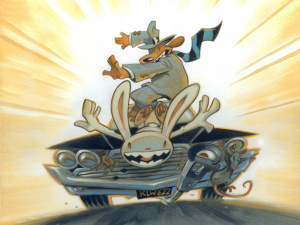 Sam & Max first hit the indie comic scene in 1987, courtesy of franchise creator Steve Purcell. In the twenty years since, they have appeared in an animated TV series, an Eisner-winning webcomic, and numerous video games. The success of the Sam & Max episodic series has fueled a renaissance for the franchise. Fond memories of the original PC game come flooding back, now we'll be able to play through all the delicious new episodes that have done so well on the PC, excellent. I have these on the PC already so won't be getting this as its a bit late. Maybe with the success of this, they will remake 'Hit the Road', possible you think?